L'Hôtel national des Invalides (The National Residence of the Invalids), is an interesting place with a number of notable sights. It is a complex that houses museums and monuments relating to French military history, a hospital and retirement home for veterans, and the burial site for France’s war heroes, in particular Napoleon Bonaparte. Louis XIV started the project in 1670 to house aged and sick soldiers. 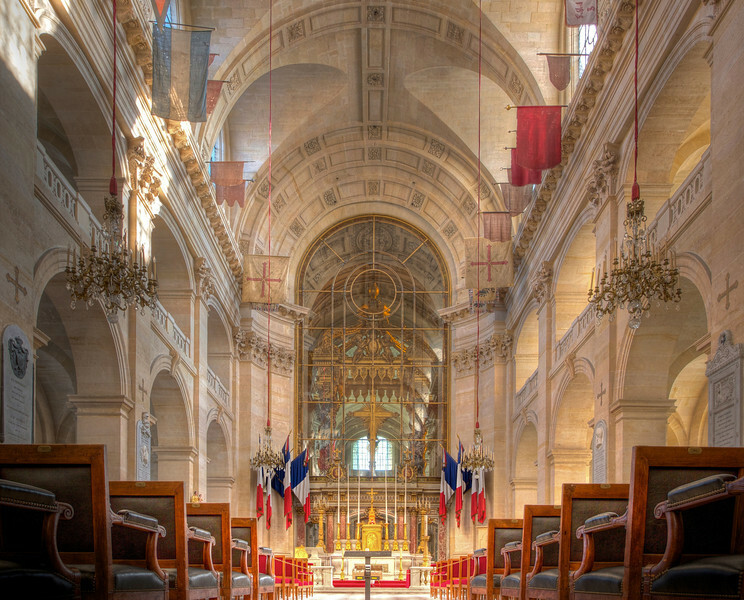 The chapel, known as Église Saint-Louis des Invalides and finished in 1679 was also built for the soldiers. Unlike most churches, the chapel is bright and filled with light, covered with white marble that has not turned gray with age. Also notable are the flags that hang from the ceiling, war trophies captured during the Napoleonic wars. Like many churches that were symbols of the monarchy and the Catholic Church, Église Saint-Louis des Invalides was damaged during the Revolution and lost many treasures. In July 1789, it was stormed by rioters who seized the cannons to use against the Bastille later the same day. There weren’t many people in the chapel when I was there. I used my GorillaPod for the two photos in the chapel. As you can see, the camera was not far off the floor. Exposure times were much faster than usual because of the brightness of the church, around 1/6 of a second for the overexposed version at 100 ISO.